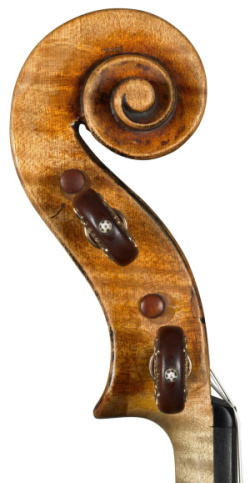 In Part I we looked at Stradivari’s tentative beginnings as a viola maker with the ‘Mahler’ of 1672 (ID 41367). Within a few years of this Stradivari had found a distinct style in his work. The elaborately inlaid and formally Amatese violins from 1677 and beyond seem to have successfully established him as a significant member of the small group of Cremonese masters. But the late 1680s were a radical period in which his violin designs were rethought and refocused. In 1690 he drew two great viola patterns: the ‘CV’ and ‘TV’, which stylistically anticipate the long violin forms ‘SL’ and ‘B’ , dated 1691 and 1692 respectively. 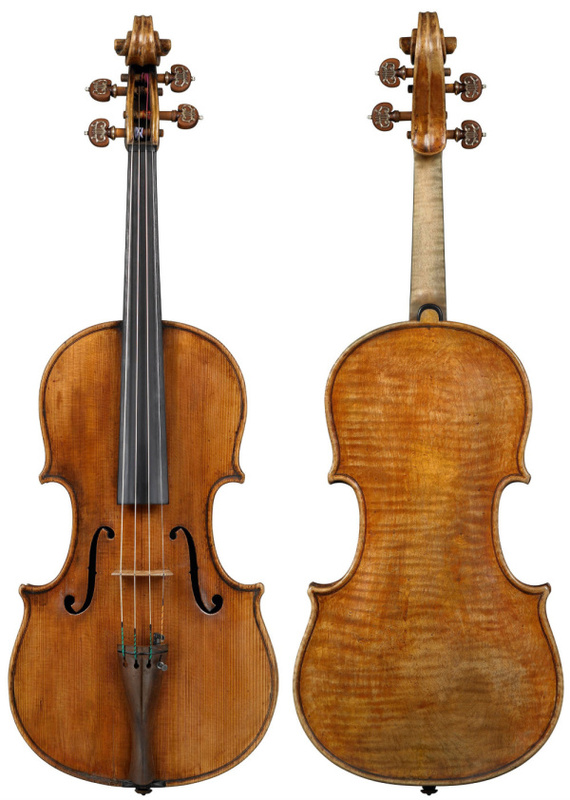 The ‘CV’ viola form (ms.205 in the Cremona Museum) is slimmer than that of the ‘Mahler’, exhibiting a gentle ‘nip and tuck’ that transforms the old pattern into Stradivari’s definitive viola model, which remained unaltered for the rest of the master’s long career. The earliest production from it was the 1690 ‘Medici’ (ID 40260). In contrast to the ‘Mahler’, it is a fully formed master work made with the very finest wood, part of a matchless quintet made for the Medici court in Florence. This quintet also included the only tenor Stradivari made, as far as we know. The magnificent 1690 ‘Medici’ tenor (ID 41401) is still preserved in Florence in almost new condition. It may well be that this commission was the last request for the largely obsolete tenor from a somewhat conservative court, still musically influenced by the French ‘Chapelle du Roi’, but Stradivari tackled it with typical thoroughness. The ‘Medici’ tenor is one of the great survivors; there is speculation that a few other tenors may be among the list of ‘missing’ Stradivaris, but judging by the condition of the wooden form itself, marked ‘TV’ for tenor viola, (ms.229 in the Cremona museum), this seems unlikely. It shows even less sign of use than the ‘Mahler’ form; the edges are crisp and unworn, although there is an intriguing scribed arc across the lower bouts that might indicate Stradivari had some intention of shortening it. From 1690 onward, Stradivari appears to have been concerned only with the contralto. The next instrument we have from the ‘CV’ form is the 1696 ‘Archinto’ (ID 40151) of the Royal Academy of Music in London. Like the ‘Medici’ it is made from the very best imported wood, the front showing the exceptionally narrow grain that appears in many of Stradivari’s instruments in this period. Its origin is unknown; whether it was made as part of a set, since broken up, is possible but not clear. Although there is a full quartet of instruments bearing the ‘Archinto’ name, they are from various dates between 1689 and 1721 and were acquired by the Archinto family at different times. In fact the earliest record of the Archinto viola is in the 18th century, in the possession of Count Gambara, a member of a distinguished intellectual and musical family in Brescia, who may well have been the original purchaser. In the same year of 1696, however, Stradivari made the ‘Spanish Court’ viola (ID 40261), which was certainly part of a commissioned set and is the only extant viola decorated in Stradivari’s unique style, with inlaid ribs and scroll, and doubled purfling with ivory insets. It remains in the Royal Palace in Madrid. Only two violas can really be included in the Golden Period, the years from 1710 to 1720 when Stradivari was at the height of his powers; his models for violin, cello and viola were virtually perfected, his arching finally evolved into the strong, flat shape that seems at the heart of the powerful tone of all these instruments, and of course the brilliant port-wine colored varnish crowns all these other achievements. There seem to have been no more large-scale commissions after this time, and only two violas incorporate all Stradivari’s most important and lasting contributions to the art of instrument making. One is the ‘Russian’ of 1715 (ID 44452), presently in the Russian State collection. A fine example in itself, it is nevertheless overshadowed by the ‘Macdonald’ (ID 40262). Presently ascribed to 1719, the date on its worn and barely legible label has in the past been interpreted as 1701 or 1721; the Hills refer to it as of the earliest year, but it is unmistakably of the Golden Period. In terms of preservation, workmanship, design and performance there are none better. The Stradivari workshop was at full capacity at this time, at a zenith of energy and creativity. Both Francesco and Omobono were active participants, as may have been the recently discovered third son, Giovanni Batta Martino, who died in 1727. There are mannerisms in the cut of the soundholes particularly, shared by other Stradivari violas and later cellos, in which the upper wing is comparatively short and flatly angled, that don’t appear in violins quite so obviously. Like all Stradivari violas it still suffers perhaps from ‘Mahler syndrome’. The head seems a little too big for the body and the instrument lacks the fine balance of the violins and cellos, possibly because of the Cremonese tradition of making the pegbox in cello form, with extended square shoulders to extend the capacity of the pegbox. But the Macdonald is a wonderfully assertive presence, a fully realized work of the Golden Period to rank alongside any violin or cello made by the master. The c. 1720 ‘Kux, Castelbarco’ (ID 41473), the next viola in chronological order, is an imposter really. It was not made as a viola at all, but a viola d’amore. 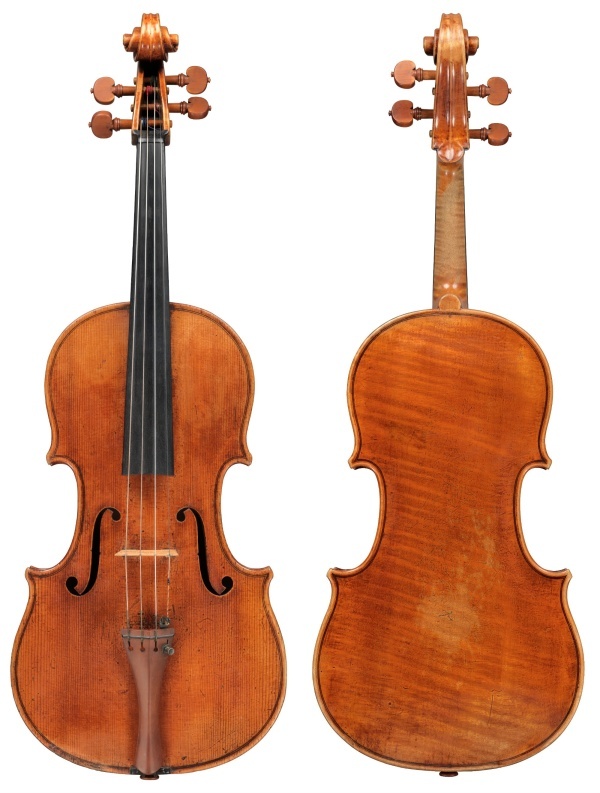 Vuillaume made a new back and provided an Amati head for the conversion, but the front, although modified in outline, is a startlingly fresh example of Stradivari’s work in this period. Around 1727 there seem to be signs of Antonio’s disengagement from the workshop. It may not be coincidental that Giovanni Batta Martino died in this year. There is one viola ascribed to this date, the ‘Cassavetti’ (ID 40115), which in most expert opinion is in large part the work of Francesco, the eldest son and appointed heir. Francesco seems to have been very much at home with the scroll carving, which is clean and very accomplished, but the purfling is a little raw and the soundholes unfluted. In his very last years, however, Antonio reasserted himself, and the 1731 ‘Paganini’ (ID 40049) is really the last viola to come entirely from his own hand. It is an amazing accomplishment for a man of 87, and a magnificent coda to his regrettably small production of violas. It has a stunning one-piece back and uncannily accurate workmanship. The final Stradivari viola is the ‘Gibson’ (ID 40264) ascribed to 1734, rounding things out as we began, with a slight oddity. It is the only viola without the cello-style shoulders on the pegbox, a very late concession to practicality perhaps. But there is in this instrument more than a hint of another hand again, that of Carlo Bergonzi. He assisted in the Casa Stradivari from 1727, and after the deaths of Antonio in 1737 and Francesco in 1743 became a permanent resident, finishing the remaining instruments. The ‘Gibson’, with its distinctive head, was surely one of these. Bergonzi himself made another viola on Stradivari’s ‘CV’ form, using the same maple wood as this, which may also have been part-prepared by the master before his death. This final run of violas, perhaps with the exception of the ‘Paganini’, may all have been commenced at any time in the life of the workshop and completed in these years. This is the sum total of Stradivari’s violas, meagre in number but certainly not in quality. There may well be lost instruments as the Hills suggest – two intended for the Duke of Savoy, another documented but untraced 1695 instrument, two ordered by Charles III of Spain in 1707 – or we may just know them under different names. It makes little difference. The fact remains that Stradivari made more violas than any other great maker of the classical period. The ‘Archinto’, the ‘Medici’, the ‘Spanish Court’, the ‘Paganini’ and of course the ‘Macdonald’ represent some of his greatest masterpieces on any terms. Stradivari was not careless of the viola; he devoted equally dedicated craftsmanship to all his work. It was the musical fashion of the time that was against it, and has diminished our inheritance of great violas.